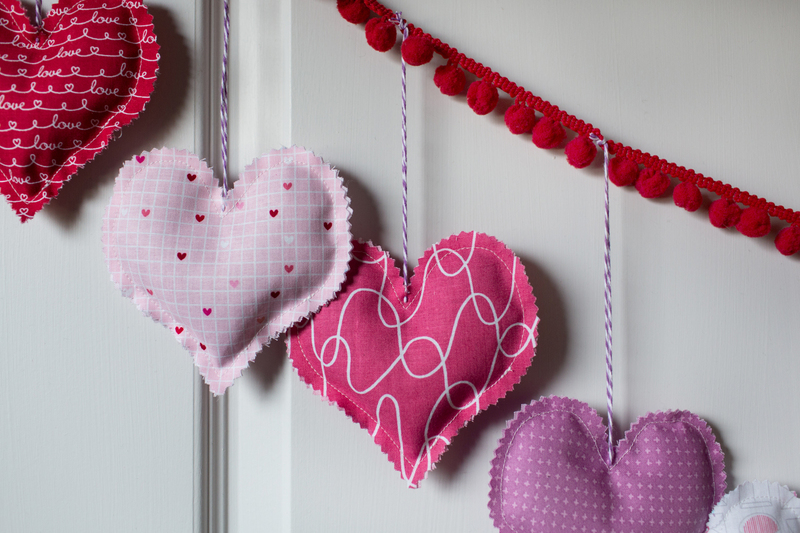 Valentine’s Day is just around the corner, and I’m very pleased to share this fun, quick and easy Lavender Sachet Heart Bunting tutorial with you. This is a beginner-friendly project you can make with your sons, daughters, or grandchildren! 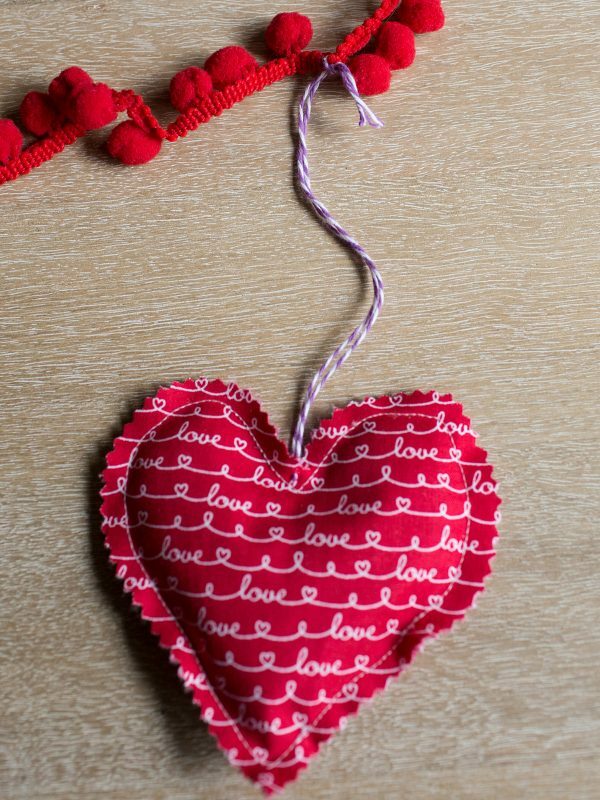 Hang these hearts together as a decoration, or make them individually to bring the relaxing fragrance of lavender into your home. 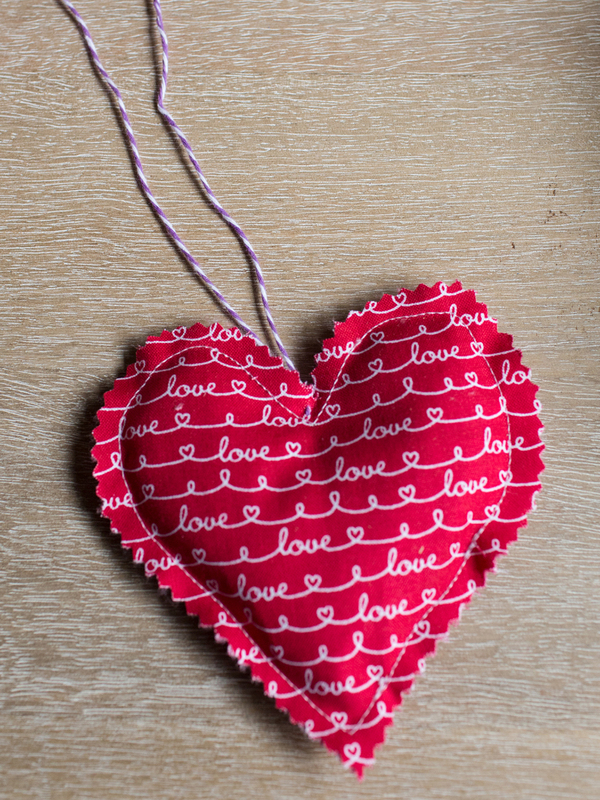 For my Lavender Sachet Heart Bunting, I used a scrappy mix of Valentine themed and red/pink/white fabrics. This project is charm square friendly! Step 1. Cut out the Heart Bunting Template. Step 2. 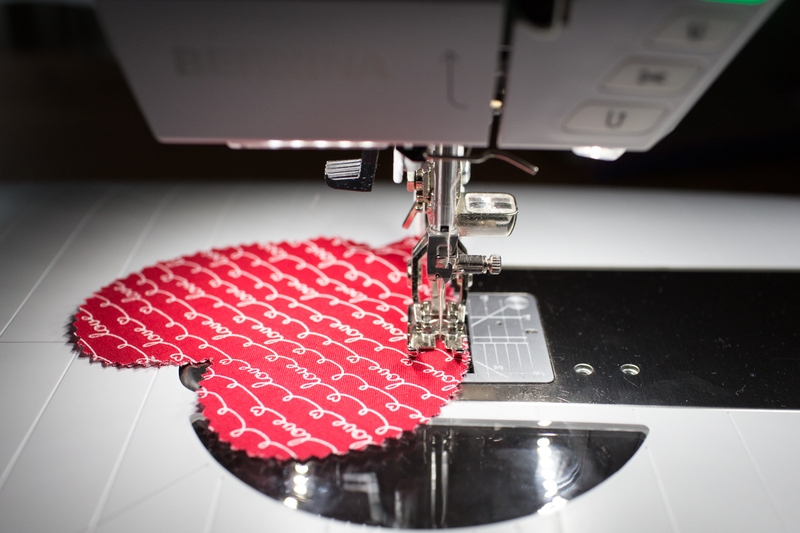 Using the Heart Bunting Template, trace 24 hearts on the wrong side of your fabric. 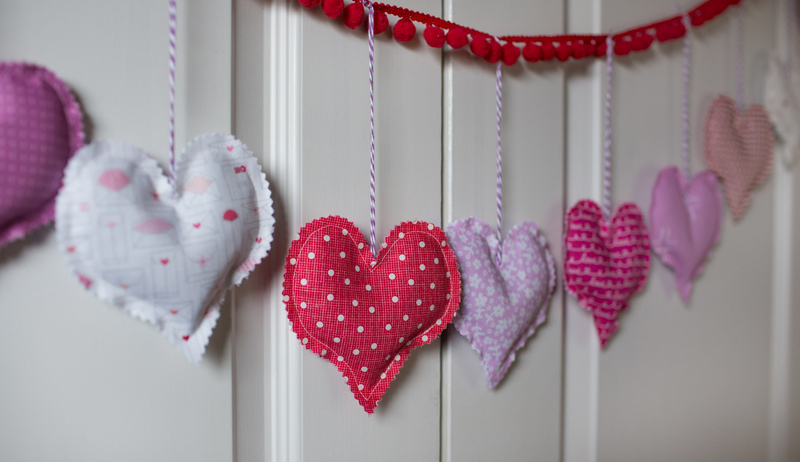 For my bunting, the front and back of each heart bunting segment is the same fabric. I cut 2 hearts from 12 fabrics. Step 3. 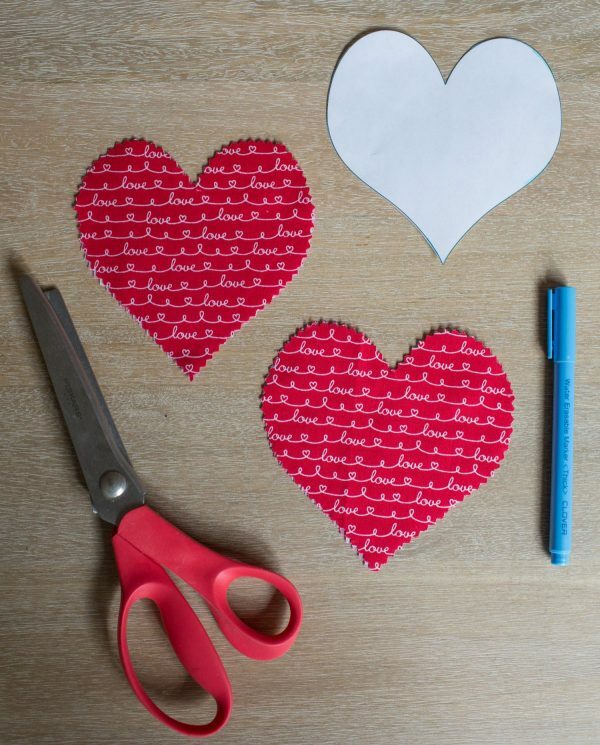 Cut out the hearts using your pinking shears. Step 4. 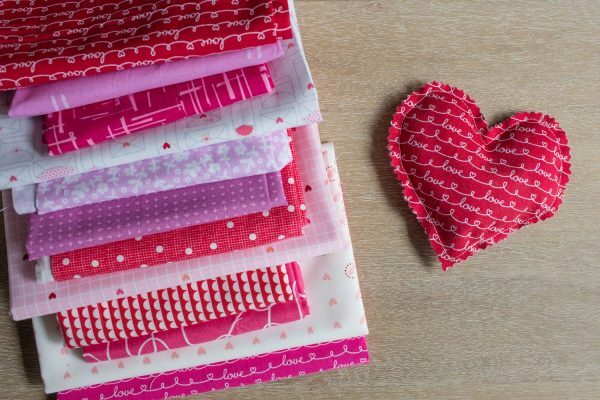 Select 2 fabric hearts. Place them wrong sides together. Stitch around the heart using a 1/4″ seam allowance, leaving about 1″ to 2″ open along one straight edge. Backstitch at the beginning and end of your stitching. Step 5. 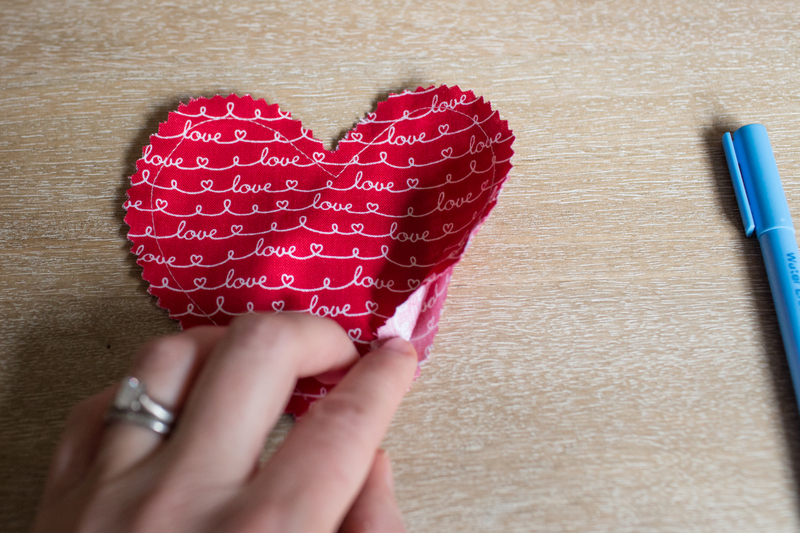 Using your funnel, fill with dried lavender. I used between 1/4 cup and 1/2 cup per heart. Step 6. 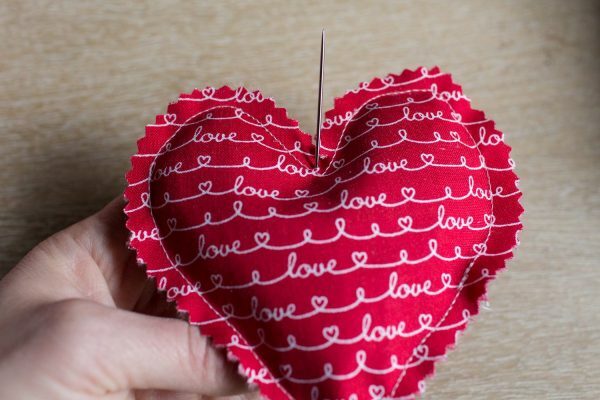 Sew the heart closed. 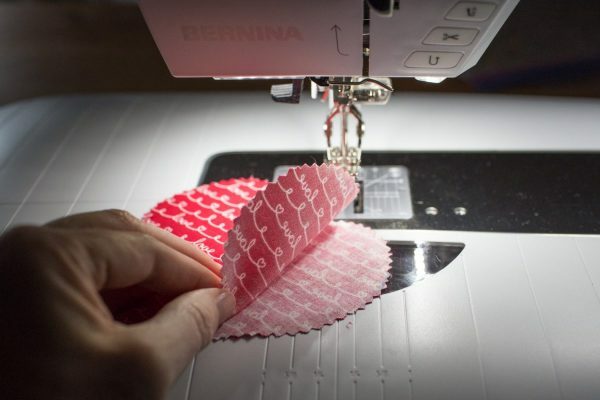 Backstitch at the beginning and end of your stitching. Step 7. Cut 14″ segments of baker’s twine. 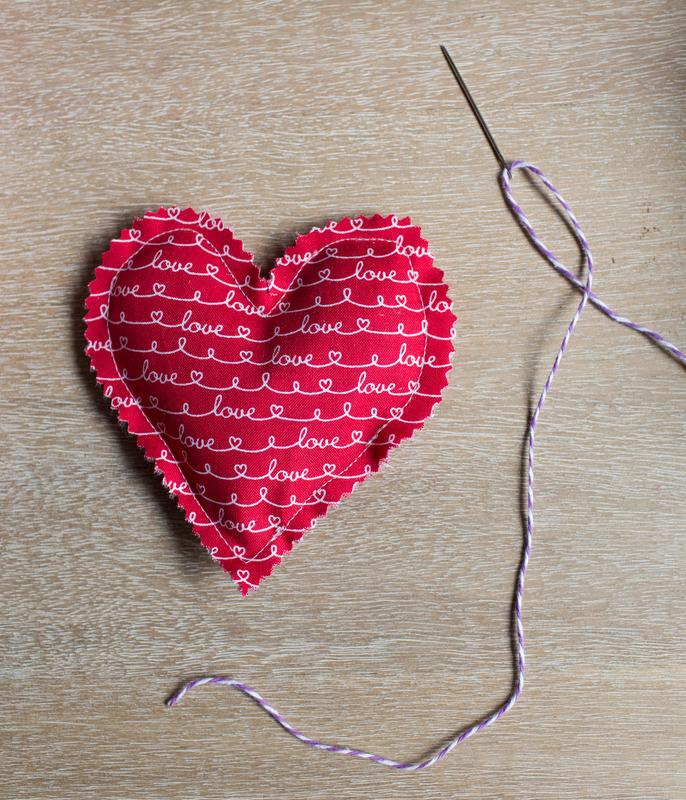 Stitch twine through the top of the heart, as shown. Pull thread even. Step 8. 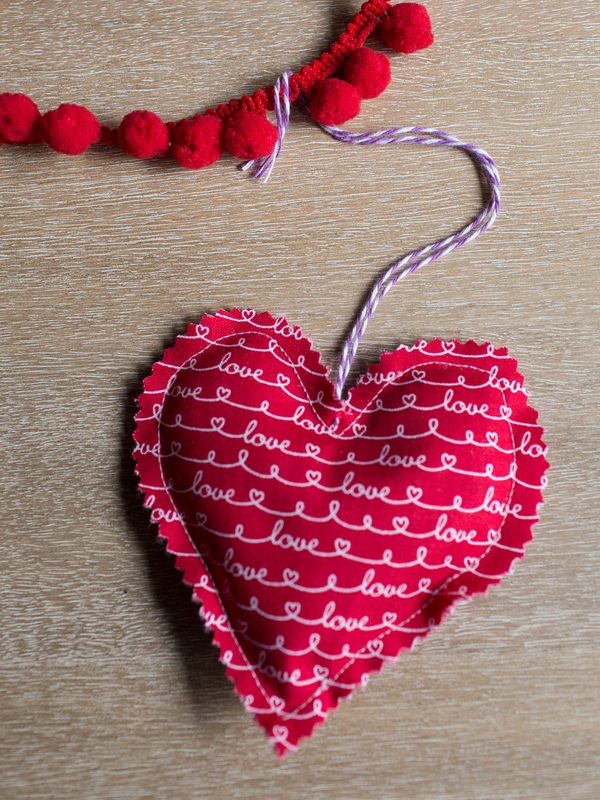 Tie twine to the PomPom strand. Step 9. 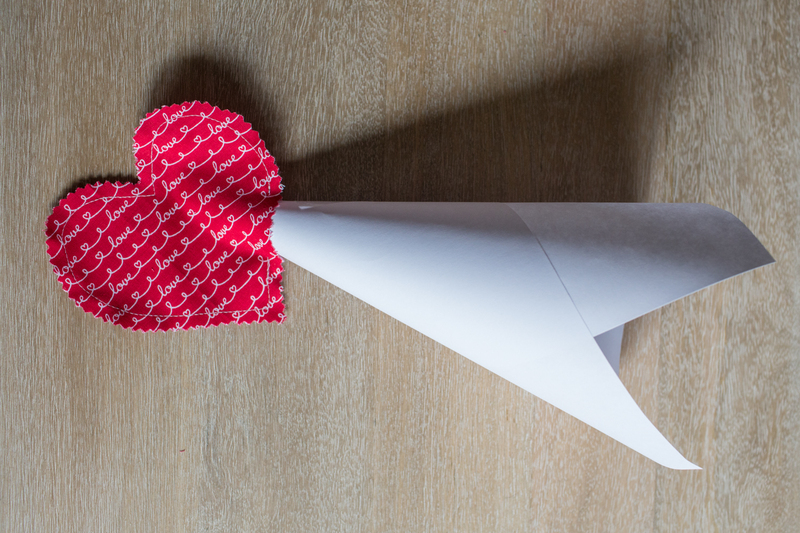 Repeat for the remaining 11 hearts. 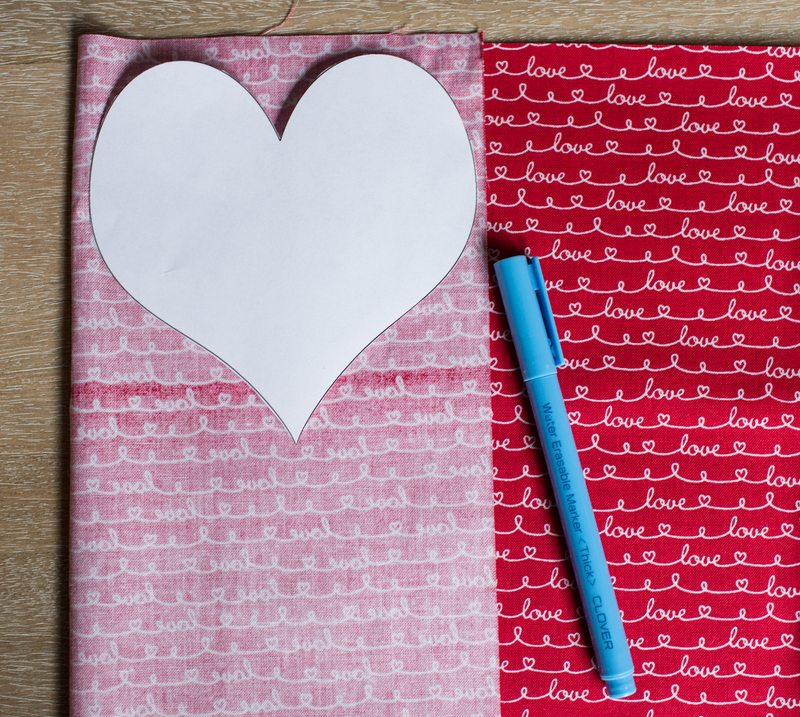 There are many ways to make this project your own. Stitch right sides together, flip right sides out, fill with lavender, hand sew closed – no raw edges! Hang your Lavender Sachet Heart Bunting and enjoy! 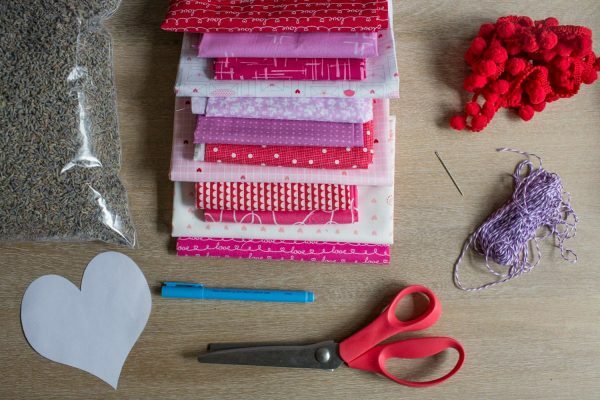 This looks like a fun project. 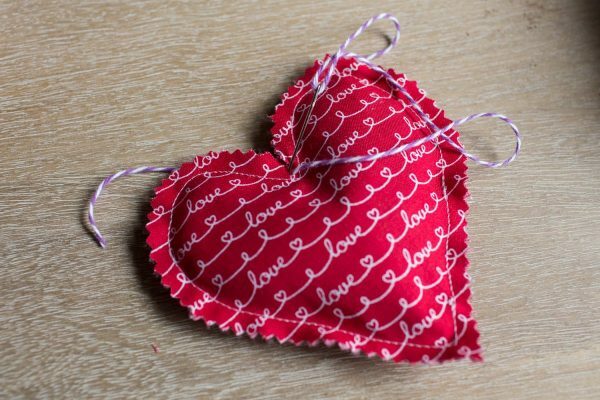 I’m going to make a few individual sachets for my Thursday group. I would like to make a correction to Step 4 – it should read ‘wrong sides together’ instead of ‘right sides together’. Thank you so much! And yes, you are correct – it should say “Wrong Sides Together” in Step 4. I will ask them to update that. 🙂 Thanks again!